Sony concluded its E3 press conference with more action packed gameplay from Insomniac’s Spider-Man, but that's not when Miles was unveiled. It was only after Sony finished wrapping things up that a bonus cutscene was reeled to the masses. Insomniac and Marvel ended their demo by abruptly cutting away from Peter Parker confronting Martin Li, back down to a gathering of idle New Yorkers watching from street view level. One of the onlookers, a teenager, is among the crowd and if you listen carefully you can hear another teen refer to him as Miles. This is an electrifying moment for Spider-Man fans and blerds alike. Morales has featured in a number of video games such as Marvel Super Hero Squad Online, Spider-Man: Unlimited, Marvel Future Fight and a couple others, but the trailer suggests that Morales's role could be prominent in Spider-Man. According to Insomniac's Community Director James Stevenson, this teaser footage was suppose to be a homage to the after-credits scenes that have graced every Marvel Studios film up to now. Even with Miles' brief cameo appearance, we still have no idea what kind of role he'll play in this game. 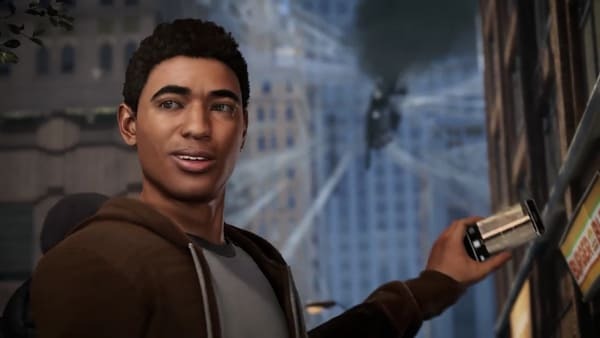 Whether or not Morales will be given a big role is still in question, but Insomniac has confirmed that Spider-Man would focus on "an experienced Peter Parker who’s more masterful at fighting big crime." Is it a possibility that Peter will have a mentor-like relationship with Miles like he does in the comics? As of now it's hard to know for sure, especially with only snippets of gameplay and information. Though entirely based on his look here, Morales doesn't seem to have superpowers just yet, despite looking somewhat older than his comic book debut appearance. So for now, it appears that Miles is another reason for Spider-Man fans everywhere to get excited about what Marvel and Insomniac Games have planned for Spider-Man PS4. Spider-Man will be released exclusively for the PlayStation 4 in 2018. Even though I grew up with Peter Parker, I'd rather play as Miles Morales. Original spiderman already has enough games under his belt. It would be cool if Miles morales is a playable character. That would be nice, but i doubt it. I love Peter Parker but it would be cool if Miles was unlockable. As long as he's playable, especially since they teased him like that. I'll be disappointed if it's only a cameo appearance by Miles Morales and nothing more. This is cool and all, but i'd rather a new black panther or Storm video game. What a tease and Spiderman ps4 comes out in 2018 with no release date? Geez. If that miles morales teaser wasn't included i wouldn't know how to feel. So are we getting Miles Morales DLC? I'd rather it be free or already in the game tbh. I would to see Peter Parker and Miles Morales working together on a mission or something. I never cared for Marvel as I'm more of a DC fan girl but this game looks amazing. Insomniac games take my damn money.